Qwix Current version: 1.01 -- Download it here! Qwix is a very simple to use XBOX Remote File Management and ISO Creation Tool. That's a pretty complicated description, so let me try again. Qwix lets you do a variety of tasks VERY easily, and right from your PC. Have a bunch of ISO's sitting on your PC that you need to load onto your XBOX? 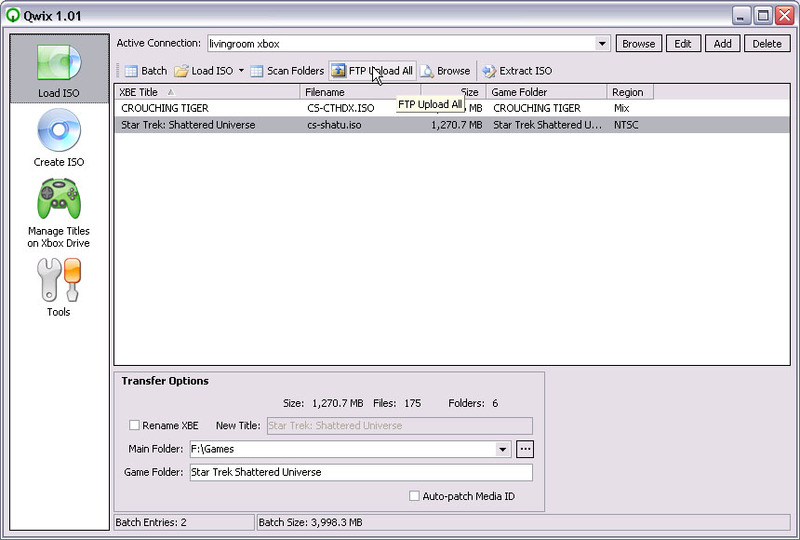 Open up Qwix and use the ISO batch upload tool. Just tell it where your ISOs are, and where you want them to be on the XBOX, and then let it fire. 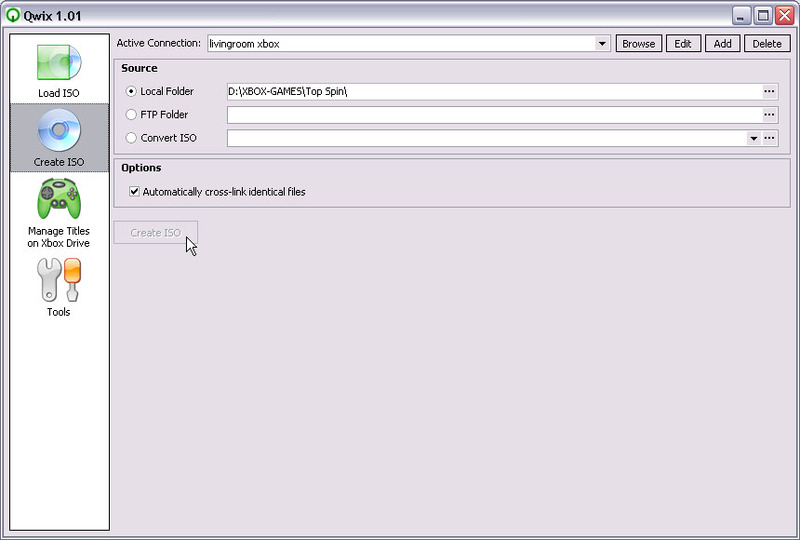 It will automagically extract the ISO's out into properly named folders in your games directory. It pulls the game name from the ISO, and even let's you change it if that isn't what you want it to be called in the games menu. Ok, that's fine and all, but what else can it do? Well, along that same path, it also creates ISOs for you. You select a game from your XBOX that you want to create an ISO from, and tell it where to save on your PC. You can even choose to crosslink files, which means that it will take common areas of the game and "cross" them so that they don't have to appear multiple times. That saves valuable diskspace, and can change a DVDR game into a CDR game! Beyond that? Well, if you are also using Avalaunch, then you need to go into your avalaunch.xml and make sure that BOOST mode is enabled, because you are gonna love that. When combined with Avalaunch, Qwix has the ability to upload ISO's to your xbox at speeds much faster than you could achieve with a normal FTP client. Give it a try, compare it, and watch Qwix get the files there 3 times faster! Enough with the chitchat, take a look at these screenshots, download it, and learn for yourself what makes this program so great!